On May 21 and 22, the Seminar Quality on Open and Distance Higher Education in Mexico (ESAD MX) has been held in Mexico City. The seminar has been organised by the Open and Distance University of Mexico (UnADM), the General Directorate of Accreditation, Incorporation and Revalidation (DGAIR), the Council for the Accreditation of Higher Education (COPAES) and the Inter-institutional Committees for the Evaluation of Higher Education (CIEES). The Universitat Oberta de Catalunya (UOC) and the Agency for the Quality of the University System of Catalonia (AQU) have advised 25 specialists in quality of the Mexican educational system and different agencies specialized in quality assessment with the final objective of contributing their experience and knowledge in the field of accreditation of online university degrees, so that Mexico can develop its own reference framework. 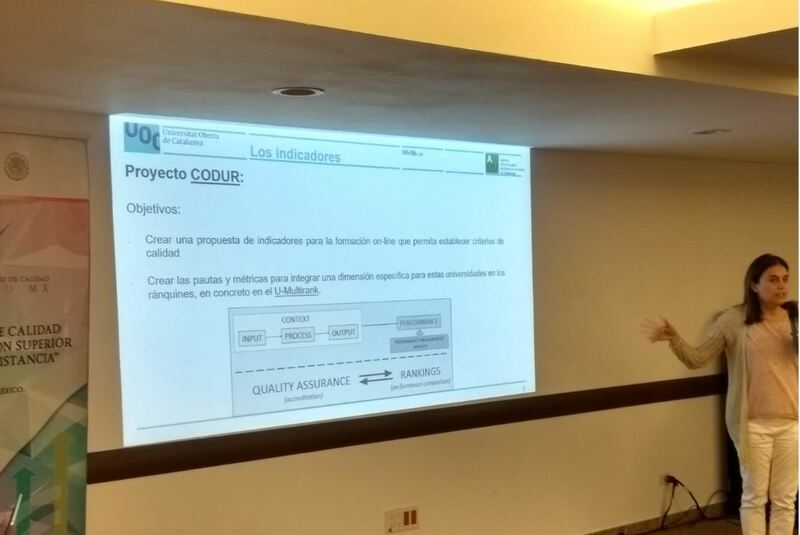 Within the framework of the ESAD Quality Seminar in Mexico, Maria Taulats, director of the UOC Office of Planning and Quality, explained how the indicators associated with the Quality System are working at the UOC and introduced the CODUR project to all attendees, exposing the objectives and the areas in which the project indicators are being defined. The attendants, representatives of high level of responsibility of quality agencies, universities and the secretary of Higher Education, assessed the suitability of the areas with the axes of their reference framework for the evaluation of quality. CACECA: Consejo de acreditación en Ciencias administrativas y contables y afines. CONAIC: Consejo nacional de acreditación en informática y computación. BUAP: Benemérita Universidad Autónoma de Puebla.